Emma’s romance with Drew hit a major pothole. The Ewings’ enemies move in for the kill on this tense episode of Dallas, which takes place three weeks after the tragic deaths of Christopher and Pamela’s twins. Chris and Pam separately deal with their mutual loss in different ways. While Pamela shuts down alone in her apartment after sending her mother Afton home, Chris lashes out with a singleminded drive to bring down the culprits responsible for killing his unborn children. He has no idea Drew played a central role in the tragedy when he congratulates Elena on breaking ground on their oil rig. His anger is further fueled by a frustrating meeting between the Ewings and a representative from TESHA who denies Ken Richards’ claim that there was evidence of sabotage and hits them with a $1 billion fine. A steamed Christopher confronts Richards about recanting his previous story to Sue Ellen and is subdued by a bouncer who happens to have worked with Elena on a rig. Angered by Elena’s attempt to cool him down, Chris accuses her of being relieved the twins are gone and gets a slap from her in response. John Ross is faring better, returning to Southfork with Bobby’s blessing and making progress in helping Pamela through the aftermath of her loss. He tells her about the bomb but leaves out the fact that her own father was responsible for it. Pamela later begs Chris to make whoever did it pay, putting him in an awkward spot, to say the least. Bobby is making some progress in figuring out the pieces of J.R.’s master plan against Cliff. Carlos del Sol brings the woman who was spotted meeting with J.R. in Mexico to meet with Bobby and she tells him J.R. was tracking an American’s involvement with a dangerous drug cartel called Mendes Ochoa. She recognizes a picture Bobby shows her of Harris as the man in question. John Ross shares the will of Rebecca Wentworth that he found on Pamela’s computer with the Ewings and Bobby explains that if his ex-wife Pam is no longer alive or cannot be found, Christopher stands to inherit one third of Barnes Global. Drew and Emma’s blossoming romance gets nipped in the bud by her daddy dearest. Emma isn’t deterred by Harris’ unveiling of Drew’s lengthy rap sheet and runs to ask him out on another date. Drew is tortured by his responsibility in the death of Christopher’s twins and welcomes the distraction of time with Emma but Harris’ goons knock him out and toss him into a car’s trunk. Emma gets a text standing her up from Drew’s cell phone, sent by Vickers, so she turns her attention to a distinguished older man eyeing her at the bar where she was to meet Drew. Sue Ellen happens to be meeting (and threatening) Ken Richards at the same bar and notices that Emma seems high. She alerts Ann to the problem. Harris, however, has a head start on pulling the reins on his willful daughter, taking her to a dark spot where his goons have bashed Drew to within an inch of his life. Harris sees from her tearful reaction that his message was received loud and clear. 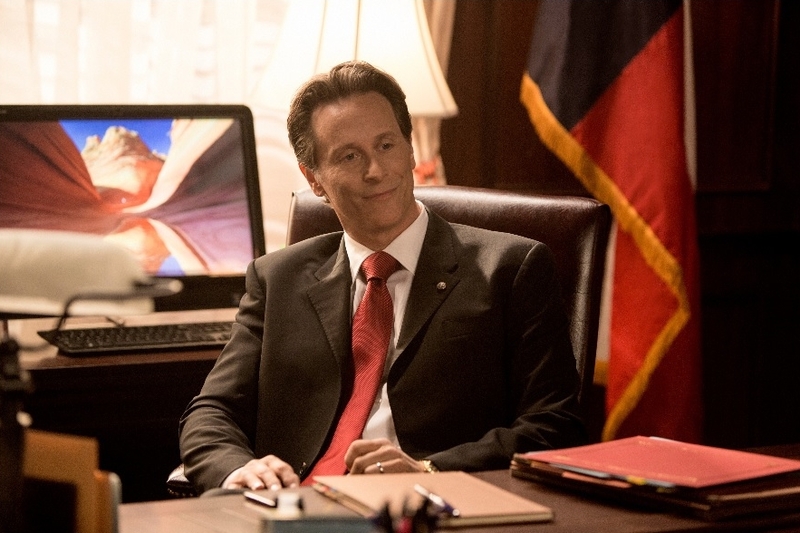 Steven Weber of “Wings” joins the Dallas fray as crooked Gov. Sam McConaughey. Harris is checking off several items on his to-do list. It turns out he was a major contributor to the campaign that elected Texas Governor Sam McConaughey, who pays back his debt by putting the screws to Richards, who in turn sends Sue Ellen evidence of the governor’s complicity in Harris’ vendetta against the Ewings. Sue Ellen’s discovery may have come too late, however, since the governor has ordered the seizure of Ewing Energies’ drilling rigs, endangering their ability to pay the fines levied against them by TESHA and endangering the company, just as Cliff had hoped. As the Ewings ponder their latest fix, Harris tells McConaughey one of his vivid stories about how a Kimodo Dragon brings down a much larger water buffalo by biting it with a slow-acting venom and waiting patiently for the buffalo to weaken. When the buffalo falls, the Kimodo feeds and Harris thinks his dinnertime has finally arrived. 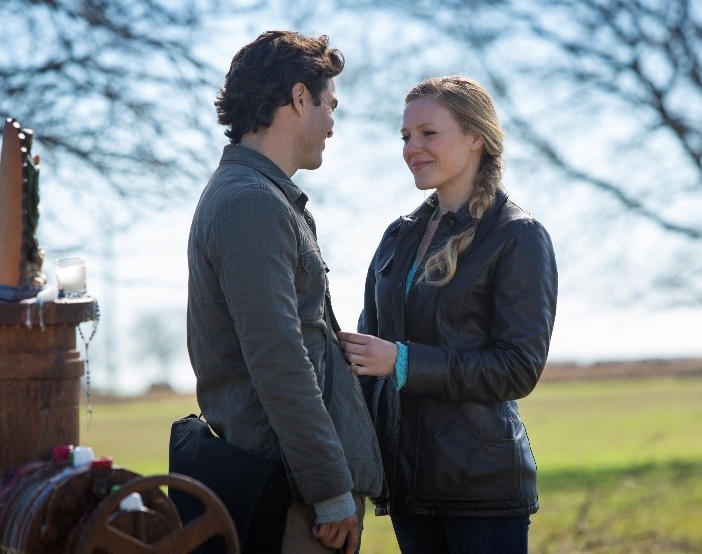 Well, now that John Ross is cheating on Pamela and Elena is mad at the Ewings, it might just happen! Stay tuned!